What is OOAK ARTWORK anyway? Original One Of A Kind Artwork. 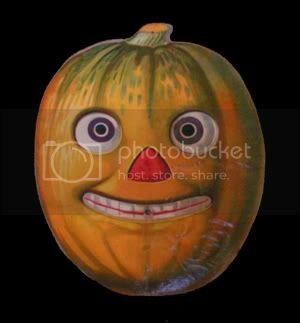 I have a friend that recently bought an OOAK Halloween artwork only to find reproductions of the same piece by Department 56 at her local gift shop. What's up with that & how can she tell for sure if her artwork is truly OOAK? Your friend should have a COA Certificate Of Authenticity signed & dated by the Halloween artist as well as the artwork having been signed somewhere on the piece. Without some form of documentation, unless one knows the artist personally your friend may have a reproduction. Companies like Department 56, Hallmark, Disney, Franklin Mint, Ashton Drake, Danbury Mint, Bethany Lowe Designs, etc., have some of the best reproductions on the market today. In time even the reproductions will go up in value especially if there was a signed limited edition of what was produced. My mother recently passed away leaving me her entire collection of wooden hand carved Halloween black cats. I have absolutely no documentation & yes the cats are all signed. Where can I find information on what this Halloween black cat collection might be worth? My soulful condolences to you & yours. 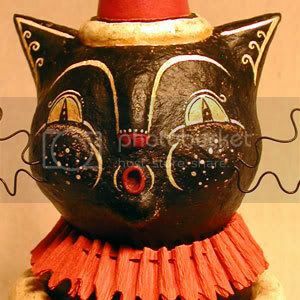 Check on the Internet by using tag words like HALLOWEEN BLACK CAT WOOD CARVED. Also eBay & other auction sites may be selling the very same cats. So check those sites as well with the tag words & the name signed on the cat collection. I'm a new artist wanting to sell my OOAK Halloween art work on the Internet. Would you recommend a website for my art work or just selling on an auction site like eBay? I would recommend both. During leaner times you can set up a website for selling your art work that did not sell on eBay as well as showcasing your new art work. 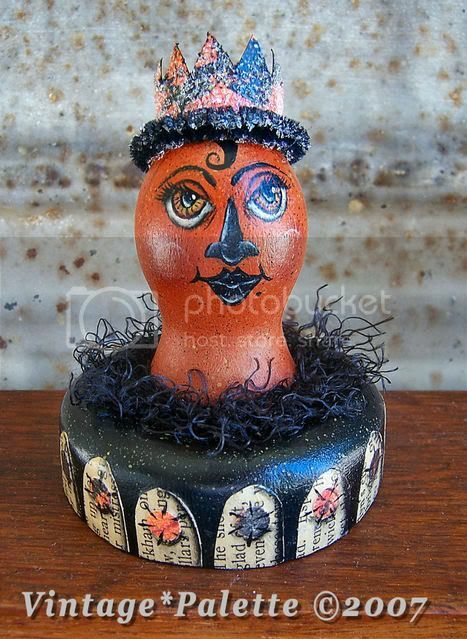 Is Halloween Original OOAK Artwork something that is just a fad or is it something that one should collect because it might go up in value? Halloween dates back to Celtic rituals thousands of years ago. Therefore Halloween OOAK Artwork will always be in vogue & not a fad. A vintage Victorian Louis Wain Black Cat OOAK Halloween Watercolor Painting recently sold on the auction block for $18,000.00. Today's Investment quality Halloween OOAK Artwork depending on expertise of the artist can garner hundreds of dollars, even thousands of dollars with a proven increase & faster return for the Halloween Art Collector. LADY LYNDY SORCERESS OF LIGHT is an advice column on COLLECTING HALLOWEEN OOAK ARTWORK. What a great idea for Halloween Art Collectors! My collection consists of a "cross collectible", Shafford black cat figurines and kitchen items. My latest find is a spice set! Great idea to do a collector's Q&A, Lyndy! Have a magickal Halloween! Dear Becky, I collect Shafford Blacks too my kindred sister. Glad you love your Halloween Sweater. Dear Carolee, I need to start promoting my Halloween artbook & what better way. Have a 'Magickal Halloween' back at you..
Dear Jodi, thank you for your kindness & genuine friendship. My favorite summer vacations were on Lake Havasu. Parasailing being my favorite pastime & speed boating under the London Bridge... Can't get much better than that! May you enlighten all to the wonders of OOAK Halloween art! What a fun idea to offer Halloween art collecting Q's and A's... Thank you for bringing awareness to the art of Halloween....We artists greatly appreciate your support! Speaking of collecting, YES, you can still send me photos of your Halloween collections for my Blog! I would love to see my creations in your home!....so send 'em on over, and I'll post them! Thanks for the Halloween Birthday wishes as well!!!! 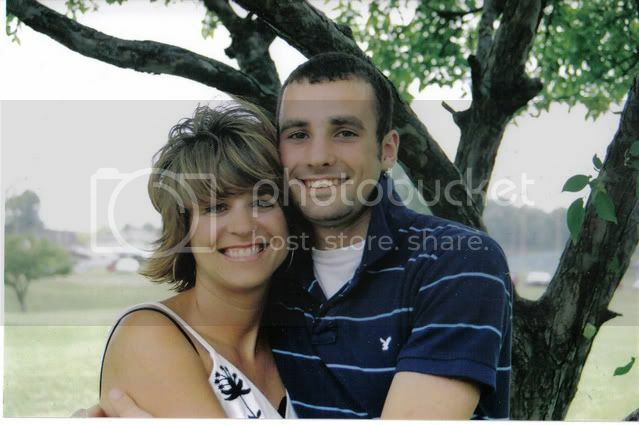 Lyndy! You are a Blog-Master! (Mistress?) I thoroughly enjoy your blog! HAPPY HALLOWEEN! Hi Lyndy, Thanks for stopping by on Halloween and sending me well wishes. You have done a fantastic job on your blog. You have been a busy girl. Looks great. *Dear John, I love that phrase: 'Blog-Mistress' & coming from the 'Blog-Master' I feel honored!